Barbara and I planned a trip to Belize with the help of Caligo Ventures. 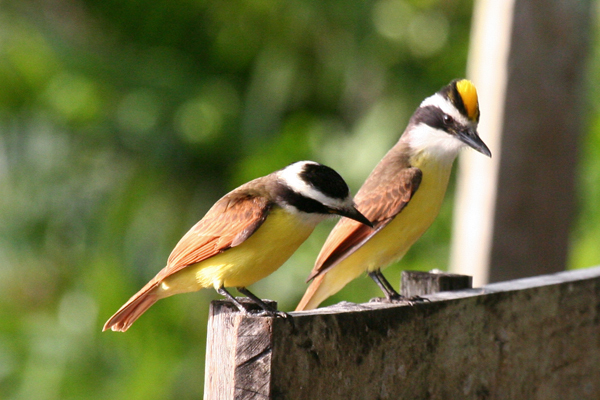 Our primary objectives were to see the interior of Belize, find birds and see the Mayan ruins. We were scheduled to leave Des Moines on January 11th, fly Delta to Atlanta and Delta from Atlanta to Belize City. Bad weather in Atlanta required a quick change of plans. We ended up going through Houston on American and arriving in Belize City pretty much on schedule as if we had been able to keep our original itinerary. The weather was generaly quite warm and humid in Belize although the nights and early mornings were very comfortable. We were met at the airport by the driver arranged for by Crooked Tree Lodge, where we were staying for 3 nights. Our cabin, one of only 6 at the Lodge, was spartan, but clean. The lodge where we took our meals was nice, and the food was very good. There were very few guests, so we nearly had the place to ourselves. The next morning we were out early with our guide, Glenn Crawford, for a morning bird walk. Crooked Tree is in flat terrain, on an island surrounded by fresh water bodies. Most of the birds we saw that first morning were the same ones we see regularly in migration in the U.S. Glenn is a 4th generation Belizian and knows the territory and the birds. We learned of the local agricultural activities, including harvesting cashews, perhaps the biggest local crop. (Later, due to the hospitality of a young couple that joined us for dinner at the Lodge, we sampled the local Cashew Wine. It reminded us of a nice Sherry.) Much of the land is quite sandy and still in a natural condition, providing good habitat. We walked hard and covered a good deal of territory. Good birds for the morning, which started at 6:30 a.m., included a Gray-necked Wood Rail (previously seen in Costa Rica), and the following new life birds: Pale-vented Pigeon, Plain-breasted Ground Dove, Olive-throated Parakeets, Rufous-tailed Hummingbirds (numerous), Red-vented Woodpecker (formerly known as Yucatan Woodpecker), Lineated Woodpecker, Ivory-billed Woodcreeper, Tropical Pewee, Yucatan Flycatcher, Variable Seedeaters, Blue-black Grassquits, and Black-cowled Orioles. Substantial numbers of other birds of species I have previously seen were also present. 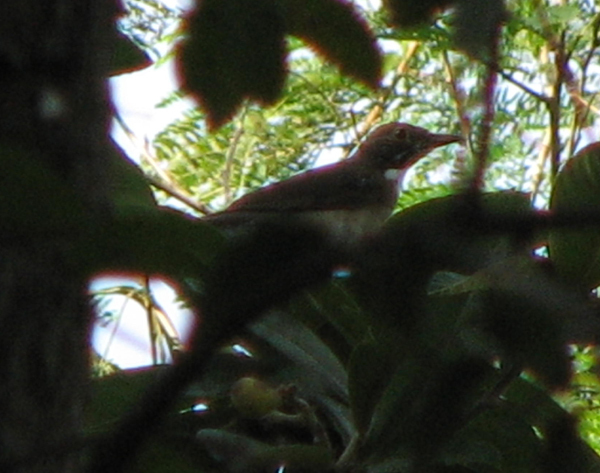 We were excited to see the Great Kiskadees in courtship mode. We had lunch and ventured out around the Lodge area for a couple of hours before Glenn met us for an afternoon walk. My most exciting finds were a Black-crowned Tityra and a Spot-breasted Wood -wren. Migratory wood warblers of the various species that we commonly see in spring or fall, were present in good numbers. We spent the afternoon with Glenn, exploring other areas near the Lodge. 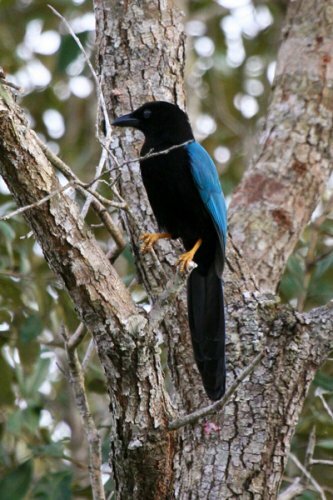 Among the more interesting birds spotted this afternoon were: Crane Hawk (not new), Ruddy Quail-dove (a fleeting glimpse), Canivet’s Emerald, and, after a long search, the best bird of our stay at Crooked Tree, Yucatan Jays. There were at least 30 of these beautiful birds harvesting the insects that were leaving their burrows in the woods to escape a marauding Army Ant swarm. They ignored us and allowed close approaches in their greed for more bugs. Day 2 at Crooked Tree began with a short drive to the lagoon, where we were joined by 2 other couples for an early morning cruise. Glenn’s brother, Rudy, served as guide and another brother, Robert, was in charge of piloting the boat. Rudy proved himself very proficient in spotting and identifying the birds. Today produced several more interesting birds, including a Bat Falcon, numbers of common water birds, including a Bare-throated Tiger-heron and numbers of Black-bellied Whistling Ducks, a Lesser Yellow-headed Vulture, a Black-collared Hawk, a Black-headed Trogon, a Yellow-billed Cacique and a Yellow-tailed Oriole. We returned to the Lodge for the afternoon and birded on our own for the rest of the day. The next morning Rudy drove us the 1 hour to the Lamani Outpost Lodge river transfer point on the New River, where we boarded a fast boat for the long ride up-river (south) to the Lamanai Outpost Lodge. The morning was clear and cool and the boat ride was fantastic. For the next 3 nights we would be staying at Lamanai Outpost Lodge and would include in our itinerary a tour of the Mayan temples at Lamani. I will write about that segment of our trip soon. I arrived at Bentsen (Texas) State Park in the lower Rio Grande Valley a little after 7:30 a.m on Thursday, January 6th. The NARBA (North American Rare Bird Alert) had reported that a Black-vented Oriole was being seen in the Park and in the adjoining Bentsen Palm Village RV Park. The best chances appeared to be in the RV Park. As I walked to the RV Park I was met by some smiling birders. The “bird”, they reported, was seen in the RV Park at 7:20, but had flown away. “No worries”, said one of the ladies; “He will be back”. So I moved on until I spotted the familiar cluster of tripod-mounted telescopes and binocular laden humans, all pointing at a red-flowering tree beside one of the driveways in the RV Park. The relaxed attitudes and lack of focus in the group told me that the bird was not there at the moment. Within 10 minutes, however, he (or she?) reappeared, feeding on the red-flowers of the Coral Bean Tree, obligingly growing and flowering right across the street from where we visitors to the RV Park were graciously allowed to congregate on this private property. To see the Black-vented Oriole so quickly (and so well) was a major surprise and a terrific way to start my day of birding in South Texas. Just a few weeks ago I was fortunate to find a pair of Streak-backed Orioles near Yuma, Arizona, constituting the 9th of the 10 Oriole species that have ever been seen (documented) in North America. 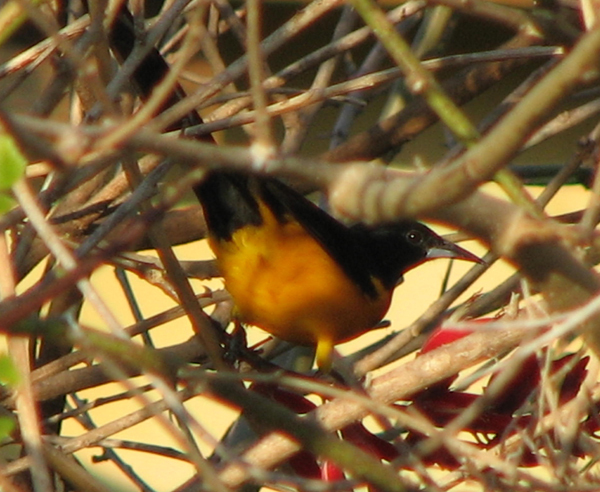 The Streak-backed Oriole is a Category 4 bird in the American Birding Association Checklist of North American birds. 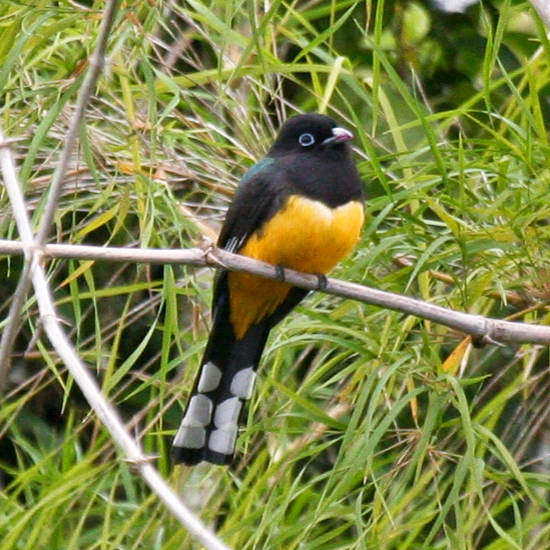 Category 4 is defined as: ”Casual-Species not recorded annually in [North America] but with 6 or more total sightings of which at least 3 must have been within the past 30 years.” The Black-vented Oriole is a Category 5, the rarest of all, defined as: “Accidental-Species recorded 5 or fewer times in North America, or fewer than 3 in the past 30 years.” So, the Black-vented Oriole, became Bird Number 696 on my life list of North American bird identifications. Not only that, but it completed my list of members of the Blackbird (Icteridae) family in North America. By 8:30 a.m I was driving east on Highway 83 to make a repeat visit to the landscaping business/residence of Allen Williams, on the east side of McAllen. I arrived about 9:00 and joined a group of 3 college students from New Hampshire who were using their college break for a one-week birding tour of Texas. 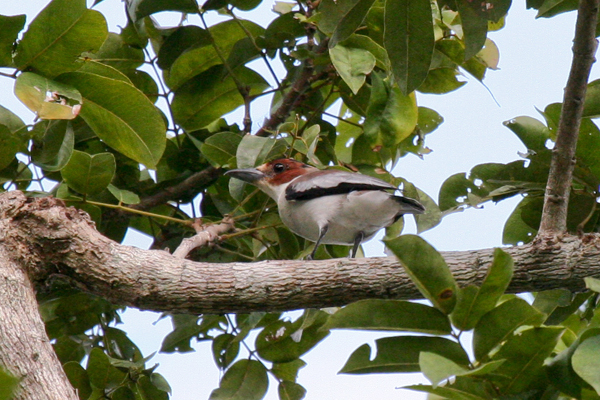 It was not long before one of them spotted the bird of interest, a Crimson-collared Grosbeak. She (referring to the bird) (clearly “she”, because of the absence of any hint of crimson in the feathers of this dimorphous species) is dull green with a distinct black hood. Allen Williams has restored the area around his home to pre-settlement vegetative state, enhanced by water features. It is an oasis in an urban setting for rare and unusual birds who find themselves out of their normal territory. He welcomes birders, with prearrangement by phone and a small contribution to maintenance of the area. This year, the female Crimson-collared Grosbeak has been on-site since mid-November and many birders have had the pleasure of seeing it, although on some days, it does not make itself known. Thanks, Allen. This ABA Category 4 bird became number 697 on my life list. This trip was already exceeding all my expectations. At 9:30 I was on the road again, this time heading east and south to Estero Llano Grande State Park, south of Weslaco. 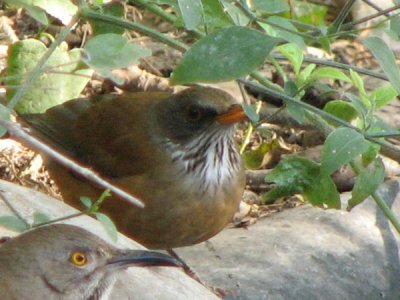 On December 29th there was a report that a White-throated Thrush (until recently called a White-throated Robin) was seen there. It had been seen subsequently on several occasions when it came to drink at a water feature in the Park. This ABA Category 5 bird was obviously of great interest to the birding community, as there were at least 15 birders standing near or sitting on conveniently located benches a short distance away from the water feature. I sat. And sat. And sat. No bird. Maybe my luck was ending. A young man sat next to me whom I recognized as having been in the group looking at the Black-vented Oriole a couple of hours earlier. We visited to pass the time of day. At 2:30, an older gentleman wearing ”Park Volunteer” identification came by to tell me (I and a recently arrived photographer, originally from Johnston, Iowa, were the only ones still sitting and waiting) that he had just seen the bird in some thick undergrowth at the edge of the Park. We quickly walked the short distance. We were quickly joined by 15 or more other eager seekers, including the New Hampshire college students and Chris, the young man who had been with me at the water feature and oriole site earlier. Chris spotted the bird and got some pictures. I did not at first see it, but later I was able to get a terrific look as it sat still on an open branch. Hurrah!!! Life bird number 698, and the day was not over. Maybe I could go look for my often sought and never seen Rufous-backed Robin. By 3:00 p.m. I was back on Highway 83 heading east through Rio Hondo to the Laguna Atascosa National Wildlife Reserve. A Rufous-backed Robin was being reported there intermittently from the third week of November. I had gone to try to find it on two different days a month or so earlier, with no success. But this day was my lucky day. About 5:00 p.m. the Rufous-backed Robin appeared at the water feature where about a dozen or so eager birders were silently hoping for that event. Silent cheering on the part of all. As luck would have it, Chris, mentioned earlier, was also there. I asked if he would send me some of the photos he had taken of the Oriole, the Thrush and the Robin, and he promised to do so. And he did so promptly. The pictures accompanying this blog were provided through the courtesy of Chris Warren of San Marcos, Texas. He is a fine birder and even if he doesn’t have 30 pounds of equipment, he managed some pretty good shots of these rare North American visitors. Thanks, Chris. So, what is the (all important) count? Right: 699. I knew immediately at that point that I was not going to look at a bird on the way back to McAllen to catch an early flight home. If I racked up number 700 in the absence of my photographic assistant and travelling companion, Barbara, I absolutely would be persona non grata at home. Ah, me!!! From the glories of 70 degree days, sunny skies and soft breezes in south Texas, to a whipping snow storm, freezing temps and dark skies in Iowa. Yet, life is sweet. Oh, and did I mention: the Rufous-backed Robin is just a Category 3 bird, meaning, “Rare-Species occurs annually in very low numbers.” This was very likely the most fruitful day of birding I will ever have in North America, if you grade it by the combined numbers (4) of new life birds multiplied by their difficulty of finding (5, 4, 4, and 3). If my math is correct, it was a Category 64 day. Of course, I don’t know of anyone else who grades success that way. I just thought it up. Yikes!!! Have I always been so obsessed with high grades??? Birding is, to use the cliche, interesting. During this past year or so I have climbed for miles up tall mountains (e.g., to find my Himalayan Snowcocks in the Rubys); I have struggled across spongy, lumpy, Grizzly Bear infected tundra (e.g., to find Bristle-thighed Curlews near Nome); I have enjoyed the Boston Symphony preparatory to looking for the Barnacle Goose on a roadside pasture in nearby Concord, from the comfort of my car; I have walked through rain and mist in freezing temperatures by Hudson’s Bay in New Brunswick (to see a Pink-footed Goose); I have endured a night in third-tier bunk on a wave tossed boat in the Pacific in a two-day (fruitless) search for Pelagic species; and a wild and bumpy day-long ride on a fast boat in the Atlantic scouting for Atlantic Pelagic species; and other, diverse searches, including, of course the most successful and least strenuous of all: sitting and waiting for “The Bird” to show up at a favorite destination, such as a water feature at Llano Grande State Park or at Laguna Atascosa National Wildlife Preserve, in Texas. While waiting for the specific, much of the general can be seen. Of most recent memory are the lovely Mexican Blue Butterflies that Chris identified and that filled the air around me while I was sitting in the shade on a warm, sunny winter afternoon in South Texas.